Is Eating Whole Grain Bread Bad for Eczema? A connection exists between eating wheat grain and a flare-up of eczema. Wheat contains four main proteins that cause an allergic reaction or intolerance. The most common wheat grain protein that is directly linked to eczema is gluten. A person may have a gluten allergy or intolerance that can trigger eczema. Talk with a doctor to determine the specific cause related to eczema. Do not attempt to self-diagnose or self-treat. A wheat allergy is a hypersensitivity of the immune system to one or more proteins in wheat products. The proteins in wheat grain cause the immune system overreact and produce IgE antibodies that attack the wheat proteins. While a wheat allergy can cause digestive complications, its primary cause is unrelated to the gastrointestinal tract. A wheat allergy can cause symptoms such as nasal congestion, asthma, irritation in the eyes and abdominal pain. Gluten intolerance, or celiac disease, is a chronic condition of the small intestines that can lead to malnutrition. Someone with gluten intolerance is unable to process the protein in the small intestines. The immune system reacts by hurting the villi that line the intestines, according to Medline Plus. This action leads to nausea, vomiting, diarrhea and other stomach complications. Because both wheat conditions, a wheat allergy and intolerance, are auto-immune disorders, they can have a direct effect of triggering eczema. Eczema is a chronic hypersensitivity of the skin. Certain triggers that disrupt the skin’s balance can cause an eczema flare-up. The skin develops small blisters that can ooze and crust over, leaving the skin leathery and exposed. Eczema is common in young children and is typically outgrown by adulthood, but can affect anyone at any age. 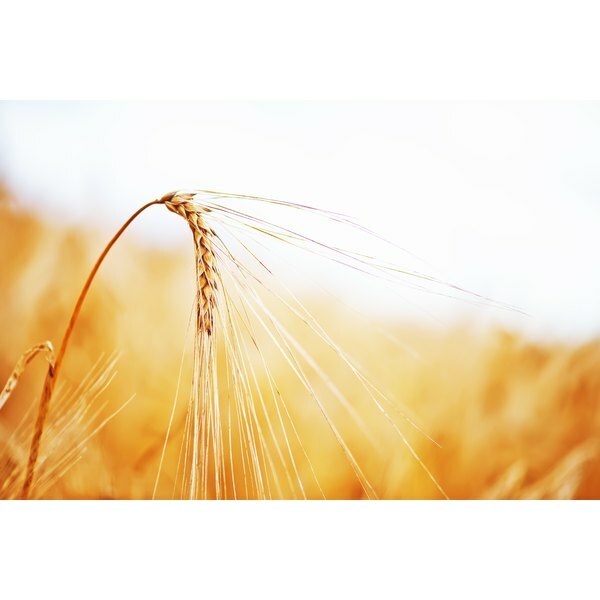 The most effective treatment to prevent eczema related to wheat grain is to remove wheat from your diet. Modify the diet by using gluten and wheat-free substitutes, such as rice flour, soy milk or other wheat-free foods. Treat eczema by applying cold compresses to the affected areas, using lotions containing hydrocortisone and taking an oral antihistamine, says Medline Plus. A common sign of a wheat allergy leading to anaphylactic shock is hives. Hives are easily confused with eczema because they are both extremely itchy and cause inflammation in the skin. Other symptoms that will accompany hives are the inability to breathe, loss of consciousness and a drop in blood pressure.